After testing several brands and types of scissors, we have determined that these nine-inch shears do the job best of all. The super-sharp serrated blades cut through uncured rubber, vulcanized rubber, rubber mounted on cushion and exposed photopolymer with ease. An extra large molded handle provides great leverage for maximum cutting power with a minimum of fatigue. You can cut straight or curved dies close to the printing characters, essential for quality stamps. 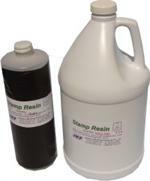 High Quailty Resin for High Quality Stamps!